I was sitting with a good friend a couple of weekends ago watching football and throwing back a couple of brews, when I came to a life changing decision: I am going to get into running shape over the next four months so that I can start and finish the Gate River Run ®! Yeah, I know. I must be crazy. Here I am at 35 years old (36 on December 28th), 5 feet 8 inches (5’9″ on my driver’s license or if I grow out my afro), and somewhere between 195 and 205 pounds (you can decide for yourself whether I am in between or somewhere near one of the ends). Other than playing Flag Football every winter in a 30 and over recreational league, I haven’t participated in any regular exercise regiment in almost 10 years. So I guess it begs the question, why am I doing this? I can answer this in three simple words: vanity, sanity, health. Vanity – This one’s easy. My daughters (7 and 4) called me fat. Not phat in the hip-hop vernacular. Just plain FAT. Sanity – Work and life are stressful enough. The economy has been in the tank for the past couple of years and is only now starting to slowing climb out of it. Exercise is a proven stress relief and the only thing it really costs is time. Health – 10 years ago I weighed 170 pounds. That means I have been gaining and average of 3.5 pounds per year. And that is no bueno. There is a history of heart disease in my family. Both my paternal grandfather and aunt died of heart attacks in their mid 40’s. That’s only about 10 years from now and it really does have me terrified. If this adventure starts me down the path of consistent exercise leading to good health, then my greatest years of my life are still ahead. Rode my bike 3 miles (apprx 1.5 each way) to the fitness center. So there you have it. This is part one of what I envision to be a weekly journal leading up to running the Gate River Run on March 13, 2010. I look forward to sharing my story along the way. Here’s to sanity, vanity, and health. One has to wonder if EA Europe received any financial consideration that would have prompted them to state publicly that the Xbox 360 is maxed out while the Playstation 3 is not. Kudos to Criterion for releasing a statement that contradicts the public belief of their parent company. Software publishers and developers should focus on producing the best possible product for multiple consoles and PC to improve the earnings potential for its stock holders. I found an old journal today. I wasn’t looking for it, truth be told. I happened to by looking for the AV cable that would allow me to connect my Sony DV camera to the TV. As I began my search, it dawned on me that for all of its technological brilliance, Sony can be extremely short-sided with its reliance on proprietary cables and technology-Betamax anyone? It was during my search that I found the journal hidden in a random box of cables in the garage. Am I the only one that has 5 or 6 different versions of the same type of cables and only 1 version of the one that I need and can’t seem to find? WTF! Anyway, this newly rediscovered journal contains an interesting selection of poems, brief stories, and novel ideas written sporadically from 1998 through 2004. Some were written during times of stress; others during times of comical whimsy. All were written with the same inate, died in the wool, love of writing. On Monday, October 6th, I returned from my trip to my mother’s home town of Kansas City, Kansas. The trip was to celebrate the 90th birthday of my grandfather, Reverend Russell W. Davis Sr, a man who has been a faithful servant of the Lord for 80 years of his life. Below are the words of tribute that I delivered during the Sunday afternoon service at the church that he founded in 1971, Christ’s Church of the Jesus Hour. My earliest memories are of traveling to Kansa with my family to visit grandma and grandpa. This was exciting because it would mean a long cross-country journey by car, but at the end I would see the family that I was not fortunate enough to see everyday back at home (in NYC). As a child, grandpa was just grandpa. I mean, I knew he was, as my cousin Tyke once said “a preacher man”, but what does that mean to a child? To me it meant, here was this wise man, a father who had–with his wife by his side–raised his children in Christ. 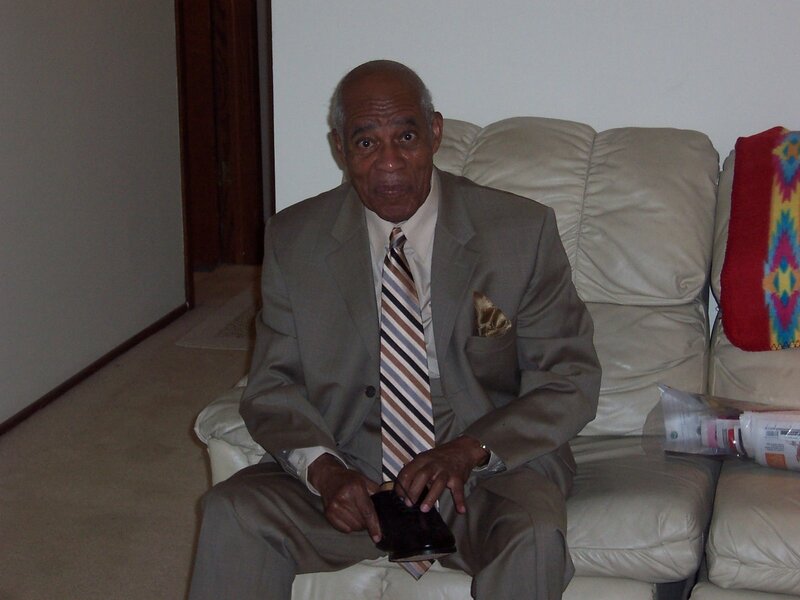 My grandfather, the Reverend Russell W. Davis, has been a faithful servant on the Lord’s team for 80 years. Not eith hours, eight days, or eight years, but eight decades. Today, Grandpa has reached the 90th anniversary of his birth. I’m not the best with math, but I’m pretty certain that he’s been serving the lord for almost 90% of his life. Now I’m just about 35 years old and there have been plenty of times that I have walked and stumbled and gotten up again. Grandpa has remained the same in his steadfast love and service of the Lord. He has shown me how to live in the world and not be of the world. Through his faithful service of the Lord, he has been the type of father that all men should strive to be. My children will be raised in Christ because that is what has been passed to me from Grandpa to my parents and now together with my wife. I am thankful that I learned to love the Lord through the consistent teachings of his faithful servant, my grandpa, Reverend Russell W. Davis, Sr.